MET Institute of Mass Media conducted an excellent workshop for its PG students about the importance of eco-friendly Ganpati idols. 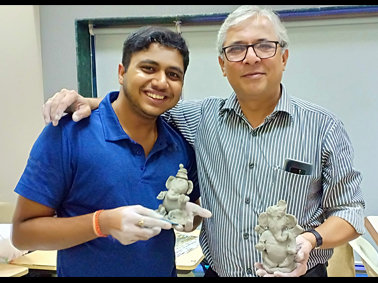 Led by Dr. Mangesh Karandikar, Director MET Institute of Mass Media, learnt the art of making clay idols. Spectacularly enchanted by the touch of the clay the PG students were enthralled and used their creativity to the maximum by engaging with the clay.